As ever, Christmas seems to have passed in the blink of an eye. We had a wonderful Christmas and I hope you did too. Lots of delicious food, relaxation, time with family and a couple of pressies too. But after all of that preparation – present planning and buying, decorating, and of course the cooking and baking – we must now move on to the next stage of December and the closing of the year. New Year’s Eve! New Year’s Eve is always a great excuse for gathering friends together and cooking up a storm. 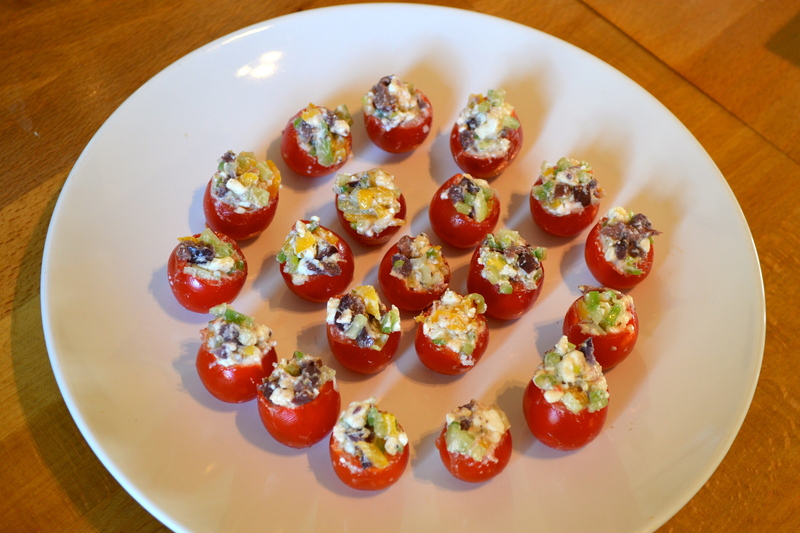 So what better time for a canapé recipe post! 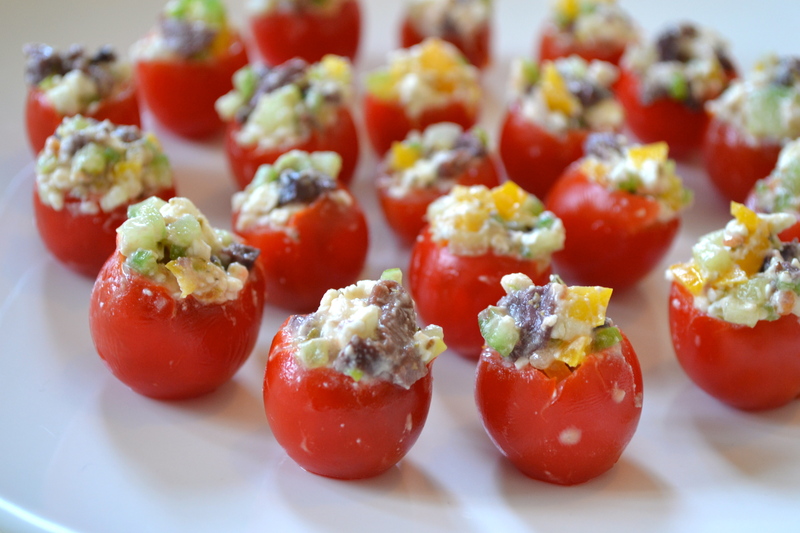 The subject of today’s post are mini Greek salads. 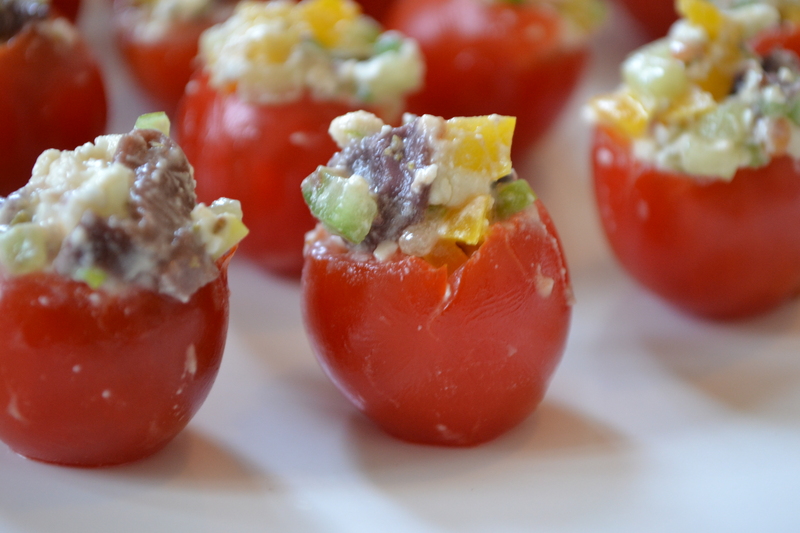 Delicious diced feta, peppers, cucumber, olives and a little spring onion, seasoned with oregano, olive oil and vinegar, served in a dinky cherry tomato. As you can imagine, the Perky Kebab was a big fan! You might be looking at these and thinking they look rather fiddly. You’d be right, but I rather think if you’re making canapés you’re probably up for a bit of effort. And the finished result is definitely well worth the little bit of time needed (it took me 30 minutes to make the 25 tomatoes). A completely delicious morsel and a fantastic vegetarian option for kicking off celebrations this New Year’s Eve’s. PS if you can’t be bothered to stuff 25 cherry tomatoes, you can just up the quantities, cut the ingredients into bigger chunks and swap the spring onion for a sliced red onion to make a normal size Greek salad. 1. 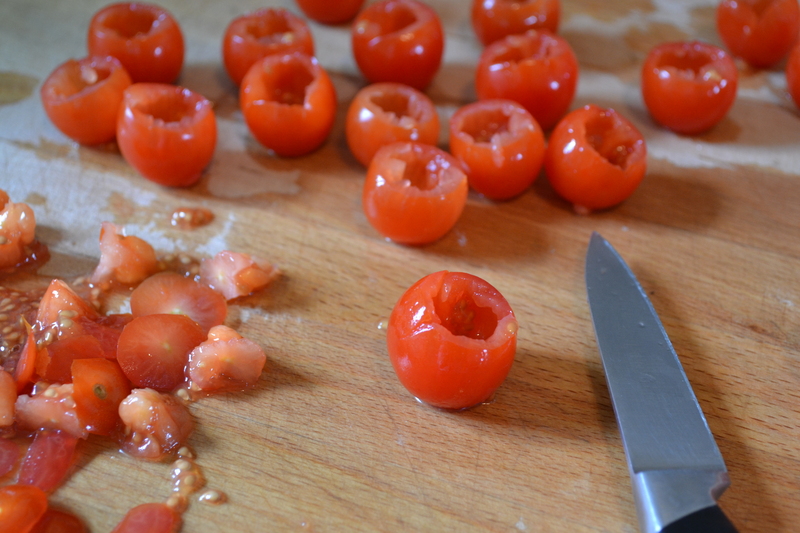 Using a sharp paring knife, cut a slither off the bottom of each cherry tomato to give them a base to sit on. Then cut off the tops, and carefully cut out the centre, removing the majority of the seeds. 2. 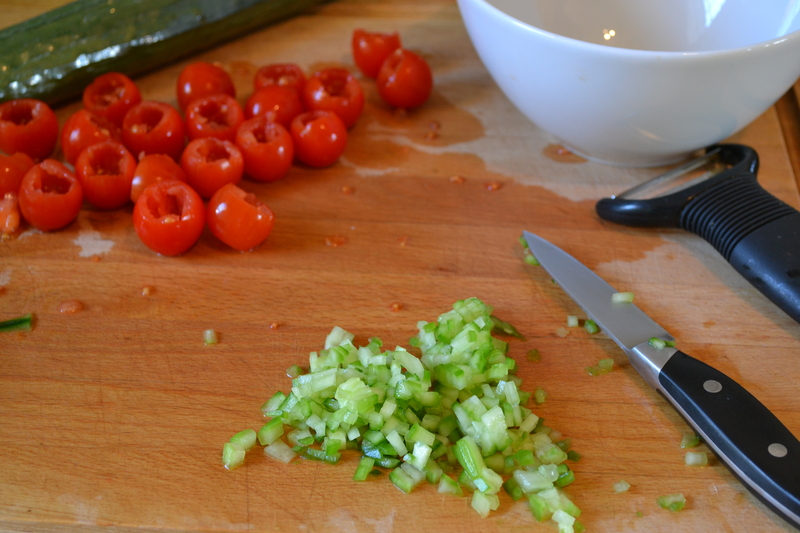 In a bowl, mix together the cucumber, pepper, olives, spring onion, and oregano. 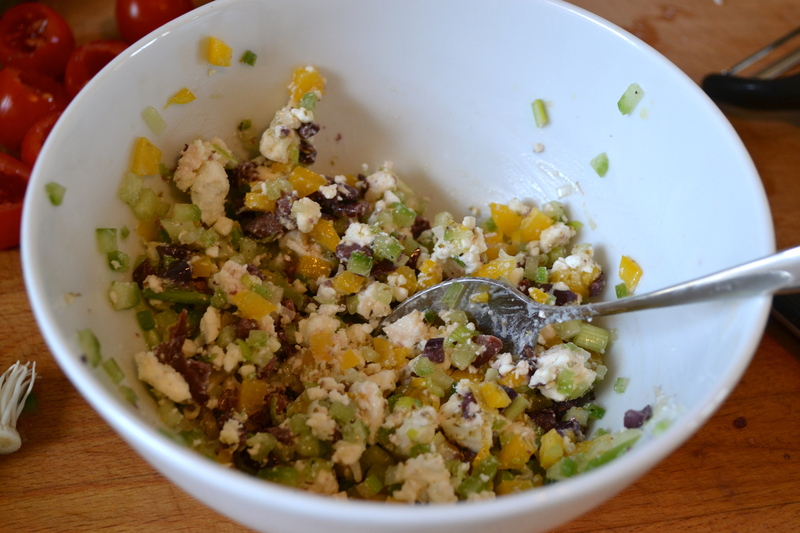 Crumble in the feta, add a grinding of pepper and a splash of olive oil and vinegar and mix well. 3. Using a teaspoon, carefully fill each tomato with the filling, trying to get as much into each one as possible. 4. Arrange on a plate and serve. The tomatoes can be made a few hours in advance of serving, covered and stored in the fridge.